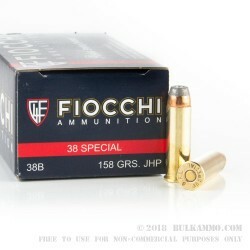 Fiocchi offers this excellent standard power .38 Special as a very good option to defensive shooters everywhere that are carrying slim, compact lightweight .38 Special revolvers that are not rated for +P ammunition but still need top quality ammunition for a wide variety of uses including personal protection. This is the load that makes the most sense as a single load to drive your newest concealed carry acquisition. 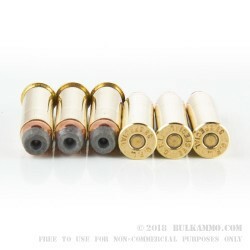 The 158 grain projectile that is built in a jacketed hollow point design and features a proven profile and grain weight, makes this a hard hitting, self-defense capable load. 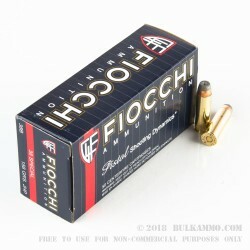 The 50 round box of ammunition that Fiocchi is offering here is perfect for any use case, as the recoil is mild, the round hits harder than other standard loads (thanks to the heavier weight projectile) and the reliability is unquestionable. 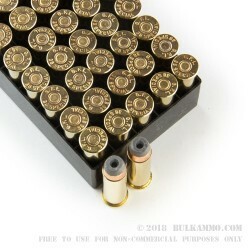 The price point gives shooters something that they cannot get elsewhere: reasonable pricing for similarly reliable, functional, accurate ammunition. Such is Fiocchi’s commitment to the market. They’ve been delivering loads like this for decades and the American shooting market loves the brand now. Long time converts of the Fiocchi brand have known the quality that Fiocchi delivers since they began shooting the company’s offerings.